15:25: While Jurgen Klopp will get the chance to build on Liverpool’s successful season regardless of tonight’s results, the same can’t be said for Zinedine Zidane. Following the disastrous defence of their La Liga crown, Sky Sports pundit Paul Merson reckons Zidane could be given the chop if things don’t go their way. “Jurgen Klopp could get Zinedine Zidane the sack tonight because he is the better manager,” Merson told the Daily Star. “You can’t judge a manager in a knockout competition because you need a bit of luck and a good draw to win them. Oxlade-Chamberlain is on his way! 14:00: Alex Oxlade-Chamberlain is heading to Kiev for the Champions League final, but he won’t be involved due to injury. As the England international got ready to fly out to Ukraine to join up with his team-mates, he rode past a group of Liverpool fans also making their way out to Eastern Europe. And the Liverpool supporters were clearly overjoyed to see the midfielder as they raced to the shuttle bus windows cheering. “It’s fair to say Liverpool fans are ready, we’re ready… we’ll see you in Kiev,” Oxlade-Chamberlain said. 12:50: It’s the song that’s followed Liverpool around Europe this season and let’s be honest, it’s pretty catchy. Footage recently emerged of Liverpool fans heading out to Kiev joyfully singing the now infamous chant non-stop as they prepared for take-off on board a plane. Rest assured they’ll be singing loud and clear at Olimpiyskiy National Sports Complex. Those at home wanting to sing along or wondering what the lyrics are? Here’s the words to Allez, Allez, Allez. 12:00: Gareth Bale will reportedly start for Real Madrid this evening against Liverpool in the Champions League final. Spanish national newspapers Marca and AS, who both have close ties with Real, claim Bale will be in the starting XI. The Welshman will form an attacking trident with Cristiano Ronaldo and Isco, meaning Karim Benzema will be on the bench. Bale has been in and out of the side all season due to injuries and he was far from guaranteed to start ahead of Benzema this evening. 10:50: Liverpool fans have been making their voices heard in the city of Kiev as they arrive in their droves. And some supporters got more than they bargained for when they came across Liverpool legend Jamie Carragher. The former defender wasted no time in leading a rendition of Mohamed Salah’s song. It seems the fun may continue if Liverpool deliver the goods tonight. 10:00: Simon Mignolet has lifted the lid on Liverpool’s dressing room playlist with Jordan Henderson the club DJ. Drake’s song ‘God’s Plan’ will be the last song the players listen to before taking to the field tonight. “Hendo is in charge of the music,” Mignolet told the Liverpool ECHO. “The moment we arrive in the dressing room after getting off the coach the physios put the playlist on. “I don’t get involved but it’s a real mix. Alberto (Moreno) has his Spanish songs and Roberto (Firmino) has a couple in Portuguese. “We have a certain playlist for just before a game. It’s always the same sequence. 09:10: Liverpool have exceeded all expectations this season and deserve their spot in the final. They’ve seen off the likes of Porto, Manchester City and Roma in the knockout stages and Klopp is hoping they can go the distance. “Nobody expected us to be here, but we are because we are Liverpool,” said Klopp. “This club has it in its DNA that it can really go for the big things. “I am pretty sure, in the second before the game, Real Madrid will be more confident than we are but the game doesn’t end in that second, it only starts. 08:40: That’s what everyone wants to know first, right? Well Mohamed Salah and Cristiano Ronaldo will definitely be starting – what else matters? Here’s the full squad list. 07:30: Today’s the day football fans! The big one… and we’re not talking about Aston Villa vs Fulham. 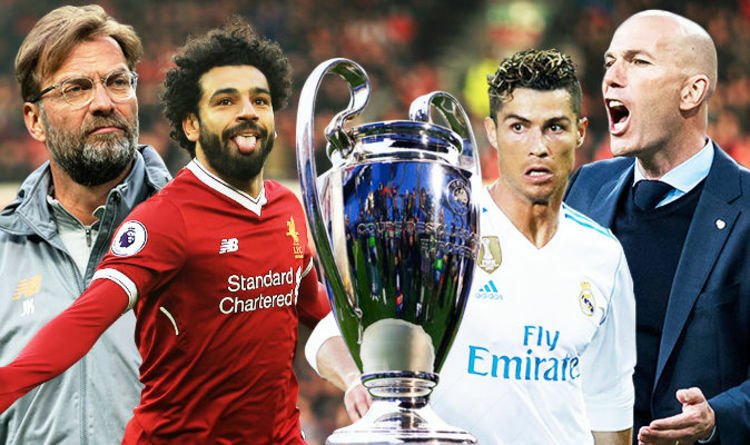 Liverpool and Real Madrid go head-to-head in Kiev this evening battling to win European football’s most prestigious prize. Liverpool are hoping to win a first Champions League trophy since their 2005 triumph under Rafa Benitez. But European giants Real Madrid stand in their way with Zinedine Zidane’s side looking to make history this evening. Should Real Madrid emerge victorious this evening they will write their name into the history books. Last season, they became the first team since AC Milan in 1990 to retain the European Cup, and the first in Champions League history to do so. No team has managed to retain the European Cup three times since since 1976 when Bayern Munich managed the feat.